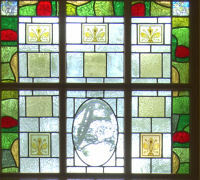 There are many uses for stained glass in the home. The examples on this page show how a plain stair window can be transformed, providing privacy and yet still letting plenty of light in, and when the sun shines through the colours of the stained glass windoe reflect on the walls and floors. I use both copper foil work for fine detail, and traditionally leaded work in order to produce all types of work. Applying hot fired paint and etching can add interesting dimensions to my work. I can now add a new dimension to work by using fused glass, layers of glass melted into each other, incorporated into window panels, door panels, wall hangings and many other form of glass work. 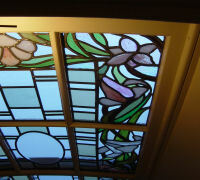 In many cases the glass can be fitted as additional glazing and can therefore go with you when you move homes.